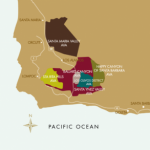 “The unique, transverse nature of the valleys of Santa Barbara Wine Country provides a patchwork quilt of micro-climates and terrains, resulting in one of the most diverse grape growing regions in the world. The valleys in the Pacific coastline actually run east-west rather than north-south, and both the coastal Santa Ynez Mountain range and the more interior San Rafael range are transverse as well. Because of this geologic oddity, the ocean breezes sweep eastward, channeled by the hills and mountains that ring the region. Heading east into the foothills, the temperatures are warm during the day and very cool during the night, whereas the vineyards that lie westward toward the ocean enjoy a mild and moderate climate. Coupled with soils that run the gamut from ancient beach and diatomaceous earth to chirt and limestone, there is a near-perfect place for a wide variety of wine grape varieties. 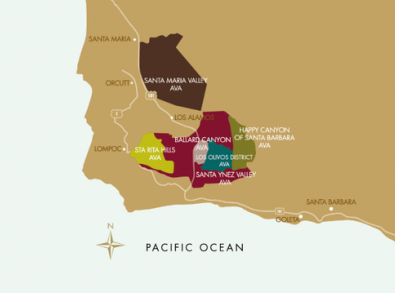 There are currently six federally-sanctioned American Viticultural Areas (AVAs) within Santa Barbara County: Santa Maria Valley and the Santa Ynez Valley which is then broken down into four sub-AVAs (West to East): Sta. Rita Hills, Ballard Canyon, Los Olivos District, and Happy Canyon of Santa Barbara. As grape growers continue to advance their understanding of the best places to plant particular wine grape varieties, the Los Alamos Valley and the Santa Maria Bench are also showing distinct characteristics that may one day lead to AVA status. 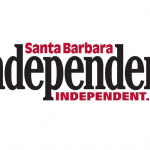 Read below for more information on each of Santa Barbara County’s AVAs. The often foggy and windswept Santa Maria Valley is the northern most appellation in Santa Barbara County. The region’s first officially approved American Viticultural Area (AVA) enjoys extremely complex soil conditions and diverse microclimates. Chardonnay and Pinot Noir are two varietals which especially benefit from the ocean’s influence, and are the flagship wines of this appellation. 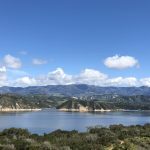 Santa Ynez Valley is a long, east-west corridor with very cool temperatures on the coast that become progressively warmer inland. Consequently, several varietals do well from Pinot Noir in the west to Cabernet Sauvignon and Merlot in the east. Several Rhône and Italian grape varietals have also gained acclaim in this versatile appellation. The largest concentration of wineries is in the Santa Ynez Valley appellation. Sta. Rita Hills is an AVA within the Santa Ynez Valley AVA. Located on the far western end of the long corridor, the marine influence is directly off the ocean providing an extremely cool climate. It is an optimal place to grow its hallmark Pinot Noir and Chardonnay. Happy Canyon is a relatively new winegrowing region recently granted its own AVA. 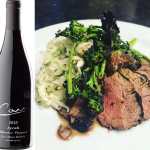 Located in the far eastern edge of the Santa Ynez Valley AVA, it delves into the San Rafael Mountains just northwest of Lake Cachuma. Its inland position means a significantly warmer climate. This region is best suited for growing Bordeaux varieties Cabernet Franc, Cabernet Sauvignon, Merlot, Petit Verdot and Sauvignon Blanc. Ballard Canyon became the fifth official AVA of Santa Barbara County on October 30th 2013. The 7,800 acre viticultural area’s soils and climate is known for producing distinctive and unique wines, a preponderance of which are Rhône varietals. 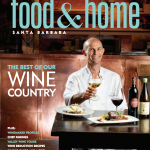 Information provided by Santa Barbara Vintners.